Marc Etherington’s painting Me and Granny is a self-portrait with his future dog, a whippet called Granny. ‘I don’t own a dog named Granny yet,’ he says. ‘My wife Kate and I have been talking about getting a whippet for a while now. Our son Lars insists we name him Granny. Born in Sydney in 1973, Etherington lives in Gymea where he has a studio space in his garage – though he sometimes works on the dining room table or the kitchen bench top. He is a self-taught artist and works as a preparator (or art handler) at Hazelhurst Regional Gallery. 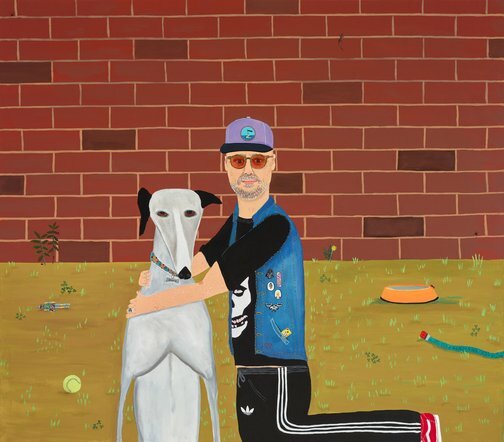 This is the fourth year in a row that he has been a finalist in the Archibald Prize. He has also been a finalist in the Sulman Prize twice.